Immigration Lawyer The Bronx: Do You Have to Leave the Country? Do You Have to Leave the Country to Apply for a US Immigration Visa? Applying for an immigration visa often means that you’ll need to leave the United States. The U.S. government prefers that you apply for the visa from your home country and then re-enter with the appropriate immigration visa once you’ve been approved. The main reason for this is to prevent anyone from overstaying their current visa while waiting for an immigration visa as well as to discourage illegal immigration by simply staying in the United States without the correct visa and documentation. However, it isn’t always the case that you have to leave the country. There are certain circumstances where you may be able to remain in the United States while applying for immigration status. It’s important that you speak to an experienced immigration lawyer in the Bronx to determine if you are eligible to remain in the United States or have a better chance at a positive outcome for your application if you make it from your home country. You are already in the United States on a valid visa. For instance, if you are here on a work visa and decide thatYou you’d like to remain permanently, you can apply for an Adjustment of Status. This means you are petitioning the government to change your current visa status from whatever is it to immigrant status. Remaining in the United States would mean you are here illegally. Often, this can jeopardize your ability to re-enter the country at a later date and could even make you ineligible for permanent residency (also known as a green card). Are You Eligible For an Adjustment of Status? You must already be in the United States on a current, valid visa. You cannot have entered the United States through the Visa Waiver Program or as an illegal immigrant. If you came to the United States as a refugee, you must have been here for one year. In most cases, you cannot have violated the terms of your current visa (there are some exceptions to this rule). If you do not fulfill all of these requirements, then you’ll need to go the other route to getting an immigration visa: Consular Processing. Consular processing is the alternative to an Adjustment of Status. This route requires that you return to your home country and apply for your visa through the U.S. consulate in your country. You’ll submit your application to that office and will complete any interviews require there as well. If you are approved, you’ll pick up your visa and passport there and then become a legal immigrant when you enter the United States through border control. The area of immigration law can be extremely tricky, due in large part to the number of exceptions there are to every rule. You might think you have to leave the country to apply for your immigration visa when, in fact, you can petition the government to allow you to remain with your family while you do so. Or you might think you are eligible for an Adjustment of Status only to find out that you are not and have now put your future applications for immigration in jeopardy. The only way that you can know for sure is to work with an experienced immigration attorney who can help guide you through the process and put your best interests at the forefront. This is one of the reasons it’s so important to consult with an immigration lawyer before you start the process. Taking the right steps from the very beginning of the process can help you achieve a positive outcome for your case. Failing to do so could mean spending more time away from your family here in the United States, spending more money on the application process, and ultimately getting a denial that leaves you stranded. Don’t let that happen to you or your family members who are trying to join you here in the United States. 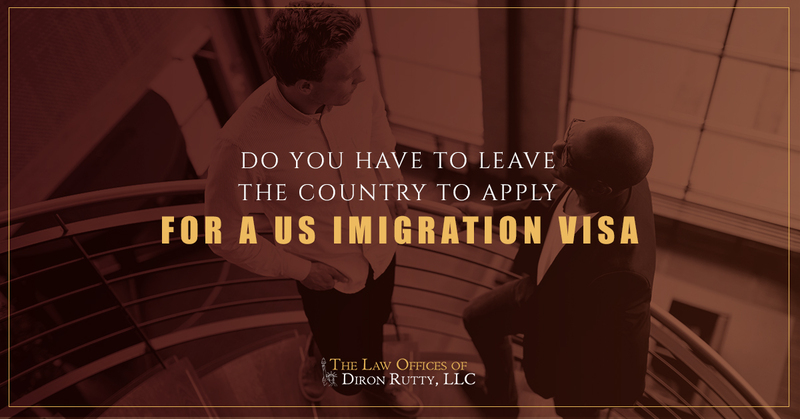 Instead, contact the Law Offices of Diron Rutty, LLC for a consultation. These consultations are free and strictly confidential, so you can get the advice that you need no matter your current status as a visitor or resident here in the United States. Our legal team can help you understand the immigration process and what steps you should take next to get the best possible outcome for your case. You can give us a call or contact us through our website. A member of our team will schedule a consultation with an experienced immigration lawyer so you can get the answers that you need. Get in touch with us today.